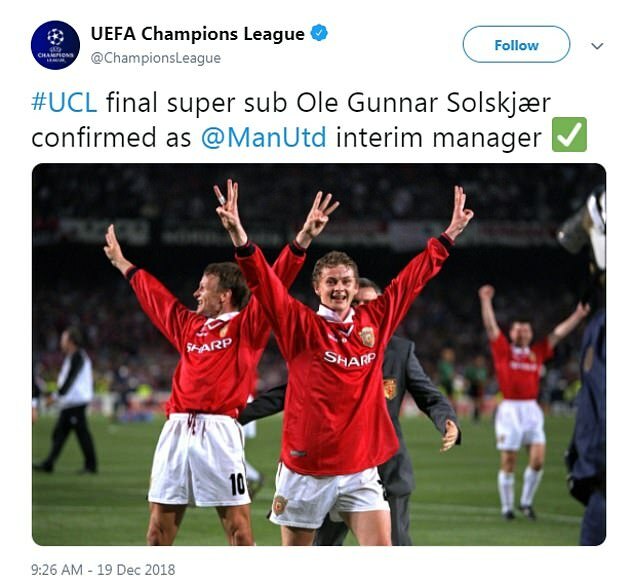 With Ole Gunnar Solskjaer’s appointment as interim Manchester United manager, a lot of people have been looking back at the best moments from his playing career. One of the highlights has to be scoring the winning goal late on in the 1999 Champions League final against Bayern Munich. It’s a truly iconic moment, although not for Bayern Munich fans, who have not been enjoying reliving their heartbreaking loss on social media. 1-0 up in the final after 90 minutes, Bayern Munich only had to survive injury time to win the Champions League. However, Teddy Sheringham’s 91st minute goal equalised the match and it looked to be headed to extra time. Moments later, Ole Gunnar Solskjaer poked the ball into the top of the net for Manchester United’s winning goal, and proceeded to slide on his knees in celebration. The Champions League Twitter account in particular has been showing videos and pictures from that night at the Camp Nou, and it all got a bit much for the Bayern Munich account. ‘Don’t take it personally @ChampionsLeague, but some of your content today is bringing back traumatic memories,’ said one post, alongside a screenshot of them having blocked the official Champions League account. It remains to be seen whether it’s a temporary blocking, or whether Bayern will allow Champions League tweets back on their timeline after the Solskjaer news has died down a bit. Bayern Munich have been struggling in the Bundesliga so far this season, still nine points off Borussia Dortmund in first place, despite their surprising loss to Fortuna Dusseldorf on Tuesday. They are still going strong in the Champions League though, having come through a fairly easy group including Ajax, Benfica, and AEK Athens. They face Liverpool in the next round, which historically would’ve been a tough draw for the English side. However, they will likely be favourites against what is an aging Bayern team.